Fever, body aches, cough… you suspect the flu. You drag yourself out of bed to visit your healthcare provider where they use a swab to take a small sample from your throat or nose for a point-of-care diagnostic test. 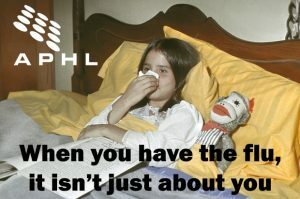 It’s positive; you’ve got the flu. After stopping at the pharmacy to pick up the antiviral medication that was prescribed, you head home to hunker down under the covers and queue up Netflix. Unfortunately for the sample your healthcare provider collected, there is no time to rest. The point-of-care diagnostic test was just the beginning; that test gives your healthcare provider the information they need to provide treatment. But the public health system needs more information on how your case fits into the national – and, in many ways, the global – flu picture. At the end of the week, your healthcare provider’s laboratory staff sends all relevant samples to the public health laboratory. This is where your sample’s journey in the public health system begins. WHO is being most affected? Young children or the elderly? Are positive patients hospitalized or outpatient? Were they vaccinated or not? 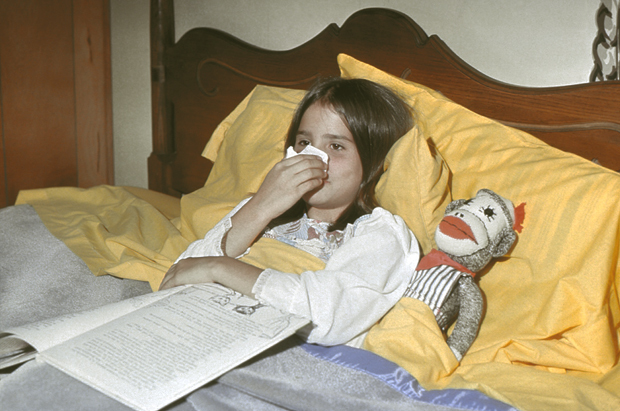 WHAT type/subtype of flu is making people sick and how prevalent is that type/subtype? Furthermore, what is the specific strain and does it match well with the current vaccine? WHEN did the season start, when does it peak and when will it end? WHERE are people getting sick? What is happening in each state and/or region? Your sample arrives at the public health laboratory’s centralized check-in where the package is opened, paperwork is reviewed and a laboratory identity is created (your personal identity no longer accompanies the sample). Because public health labs receive hundreds of samples every day for not only respiratory illnesses such as flu, but also diarrheal illnesses, sexually transmitted infections, newborn genetic screening and many others, this process is critical to ensure each sample is accurately documented and delivered to the appropriate laboratory for testing. In fact, during the course of one flu season, a state public health laboratory can receive approximately 4,000 samples for influenza testing alone! Once that process is completed, your sample is delivered to the virology lab for testing. Your sample has been kept cold and properly stored to maintain the integrity of the virus, which is important for the laboratory testing. This lab uses a molecular method called PCR to rapidly amplify and detect a region of viral RNA. In fact, the PCR test performed at public health labs is specially designed to not only confirm and subtype flu, but also to detect new and emerging flu viruses. This is an important function of public health labs as our nation’s first line of detection for novel flu viruses. The test results for your sample indicate you are sick with influenza B. Because your case is typical for flu season, state epidemiologists do not initiate further investigation. However, the data from your sample does get included in their weekly summary report informing physicians and the public of influenza activity in your state. Furthermore, this information is recorded electronically in the laboratory information management system (LIMS) and a lab report is faxed back to your healthcare provider’s office. (This information typically would not impact your treatment.) 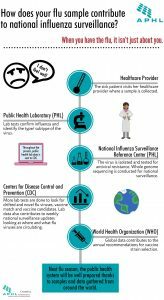 Data is also transmitted to the Centers for Disease Control and Prevention (CDC) for national flu surveillance using the Public Health Laboratory Interoperability Project (PHLIP). Standardized PHLIP messaging simplifies the secured electronic transfer between public health laboratories. Once at CDC the data contributes to FluView, their weekly flu surveillance report. Your sample was selected to be included in your state public health lab’s biweekly shipment to their designated national Reference Center – one of three National Influenza Surveillance Reference Centers, state public health laboratories that act as an extension of CDC’s Influenza Division – where it will be isolated and further characterized. Every two weeks during flu season, all state and some local public health laboratories participate in national surveillance by sending up to eight influenza specimens to one of three National Influenza Surveillance Reference Centers. These eight specimens consist of up to two samples of the four seasonal strains of flu: influenza A(H3N2), influenza A(H1N1)pdm09, influenza B/Yamagata lineage and influenza B/Victoria lineage positive specimens. When combined with all of the other public health lab submissions, this relatively small number of samples allows CDC to watch closely for drift. (Drift happens when small genetic changes accumulate over time as a virus replicates and result in viruses that are antigenically different. When this happens, the body’s immune system may not recognize those viruses and may have trouble fighting them off). And with all of that information, CDC can be 95% confident that, should a drift variant emerge at 3% prevalence or higher across the country, at least one of those drift variants will be detected over a month surveillance period. Knowing about drift sooner would hopefully lead to a quicker response than before this submission guidance was in place. At the reference centers and CDC, these specimens undergo further antigenic and genetic characterization which generates data that helps select strains to be used in the development of future seasonal vaccines. After a whirlwind of tests, your sample finally gets to rest in a chilly -80°C freezer. Public health laboratories keep samples like yours should additional testing be needed and to aid in the development and validation of new laboratory tests or methods. While the sample sits frozen, the data remains actively in play. Public health officials will look at the data from your sample along with thousands of other data points to determine what influenza strains are circulating in the United States, detect novel viruses and monitor whether the virus begins to drift away from the strains in the vaccine. On an even bigger scale, vaccine strain selection is a global process so your sample may ultimately inform vaccine strain selection for the entire world. Next time you are sick and your healthcare provider takes a little sample from your nose, remember that you are not only getting the diagnosis necessary for your own treatment but you’re contributing to national and global influenza response.